The activist rightly blames bad dealmaking for the near-halving of the foodmaker’s share price, and wants shareholders to replace the whole board. Yet cost cuts from those bad deals should raise Campbell’s valuation whatever happens. A mass ousting is neither likely nor helpful. A workman wipes the main pillars of the National Gallery of Scotland complex, that were unveiled to show an Andy Warhol 'Campbell's Soup cans' artwork covering, Edinburgh, Scotland July 31, 2007. 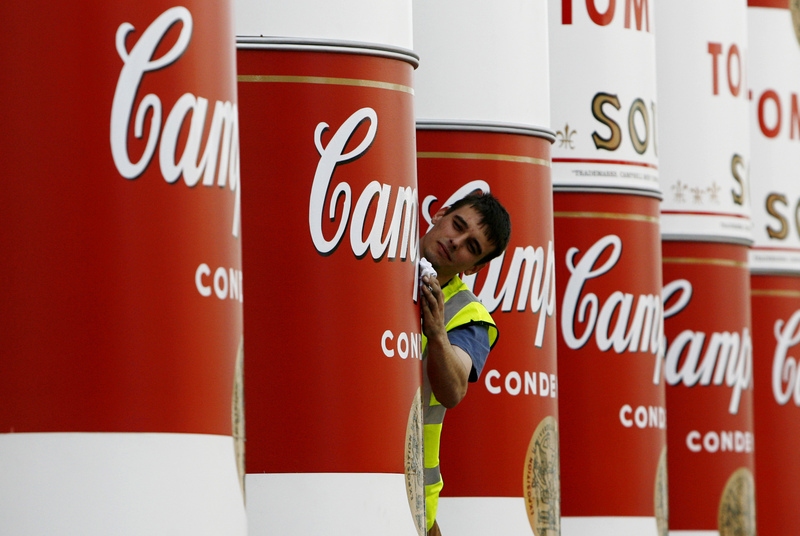 Activist fund Third Point Capital detailed a 100-day plan for Campbell Soup on Oct. 30, including a proposal to “hit the ground running” with new management, improving the company’s main soup business and cutting costs. The fund run by investor Dan Loeb has nominated a full slate of 12 directors to replace the current board, at a vote that is scheduled for Nov. 29. Third Point owns a nearly 7 percent stake. Three descendants of the founder of Campbell Soup are among its top shareholders, collectively owning around 40 percent of the stock.